Product DescriptionLegendary repeatability and resolution. You asked for it, you got it. 30mm tube, 42mm objective, newly designed worm drive side focus, 1/8" click adjustments and our new BR-8 dot reticule, designed in 1 MOA and 1/2 MOA increments. This new reticule has a small floating target dot in the center. Oversized ocular with real +/- diopter adjustment, features long eye relief and fast focusing of the reticule image. Top end super compressed Glass from Schott, Germany, with the finest broad band fully multicoating technology. 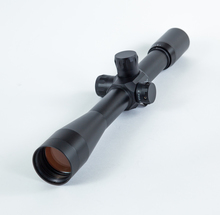 This scope will present you with the finest optical and mechanical performance. The image and repeatability are unmatched. Reticles available: 1. BR-8 with MOA tick marks and 1/8 floating center dot. 2. Fine crosshair. FIELD OF VIEW (100 YDS.) 4.2 FT.
RETICLE-TOTAL ADJUSTMENT RANGE 45 MOA @100 YDS. CLICK VALUE 1/8 MOA AT 100 YDS.